Cowdenbeath's Mo Yaqub clears from Jordon Brown. All good things eventually come to an end and Peterhead’s 19-game unbeaten league run finally bit the dust. The annoying thing about this defeat was not only was it by the team propping up the division that had been humbled 7-0 in their last visit to Balmoor but the limp fashion the proud record was lost. 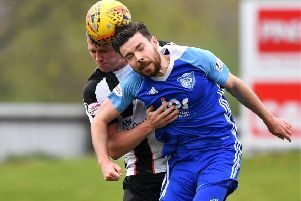 Cowden certainly had good reason to strive for a win as they try to battle out the automatic relegation spot but they didn’t really have to try too hard to head south with the points that also meant that Dunfermline were crowned Division One champions in a day of double whammys. The Blue Toon were certainly never at the races and although an improved second half performance could have grabbed a point, the display was disappointing. The Fifers should have gone in front in the fifth minute. Defensive slackness allowed Liam Callachan a clear sight of goal but from which he should have done better than seeing his shot blocked. After 20 minutes full back Dean Brett unleashed a 35-yard wind assisted shot that flew narrowly wide and had that gone in it would surely have definitely been game over. As half time approached a neat passing move ended with Jordan Brown shooting wide. In between those chances the visitors scored what turned out to be the winner. It was a well-taken goal but came from a poor kick out that was picked up by Lewis Milne in midfield. He threaded a perfectly weighted pass through the centre and the wily Greig Spence used all his experience to curl the ball around Graeme Smith and into the right side of the goal. With their record of improved second half performance a comeback was expected and made even more likely with a positive start to the second half. A McAllister free kick went inches over the crossbar after a foul on Leighton McIntosh then after 56 minutes Nathan Blockley whipped over a low driven cross that Brown sidefooted first time with pace but send the ball wide that on another day would have ended up in the net. The evidence that this wasn’t to be the home side’s day came after 67 minutes. A long kick out by Smith found substitute Andy Rodgers but the hero a week earlier opted to try lobbing the ball over the head of Adam rather than go for a direct shot. So ended a dismal display on a miserable day with thoughts turning to the trip to Forfar Athletic on Saturday.